I just finished watching Caffeinated, the story of people behind the mighty coffee bean. Originating in a thin tropical band at just the right altitude around the globe, the end-product of the bean ends up as espresso, americano, drip, pour-over, lattes, and more. As I sat listening to the stories of farmers in Nicaragua, Ethiopia, India and beyond, told through translators and purveyors of fine coffees in US, Italy and elsewhere, I couldn’t resist drawing parallels to my other favorite spirit – Whisky. 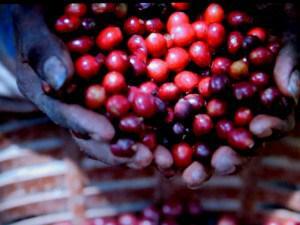 Coffee grows as a berry, and looks suspiciously like a cranberry on those plants. The bright red shell protects the sugars and bean contained within, clustered in various stages of ripeness. When separated by color, size, shape, and smell, the beans are extracted, allowed to ferment for 27-32 hours, washed, dried on concrete surfaces, and packed away for shipment. Arriving at culinary centers around the world, the coffee bean (white, in color) is roasted for a perfect aroma, sheen, and readiness for grind. What ends up in our cup is a marvelous drink – sweet on its own, intoxicating in its own way, and communal in spirit. Additions like milk and flavors address the palate in fruity, woody, and body. Barley seeds are immersed in water to allow them to open and release their sugars. Dried on concrete floors for 48 to 72 hours, some are infused with smoke from peat for their own aroma. Yeast converts the sugar to alcohol, ready for a drink. Allowed to relax patiently in wood, the spirit adopts the flavors of the casks. Enjoyed in communal celebrations, the spirit is enjoyed globally. So much like coffee. The thing that struck me in the movie was how the farmers are resistant to change. A coffee plant may reach production ability in about four years – an eternity of risk before rewards are available. The story no different in whisky producing regions that religiously protect everything from the malting process and the shape (including dents) of the still to maintain uniformity. Unlike coffee, whisky has an even longer patience test – often lasting seven or more years. If you subscribe to Amazon Prime, movies about both drinks are available as Caffeinated and Whisky. Ancient processes to produce drinks that mark the beginning and end to a perfect day.